For you windows users who feels bored with windows interfaces but not really good at handling other OS such as linux, you can try to install Ubuntu themes for Windows7. By using Ubuntu themes you can feel the new atmosphere of Linux interface on your Windows 7. This themes is really suited for you who like the Linux interface without needed to Install real Linux OS on your system. This theme consist of 15 images which is really “Ubuntu” that can automatically change itself every 20 minutes ( you can modify it). 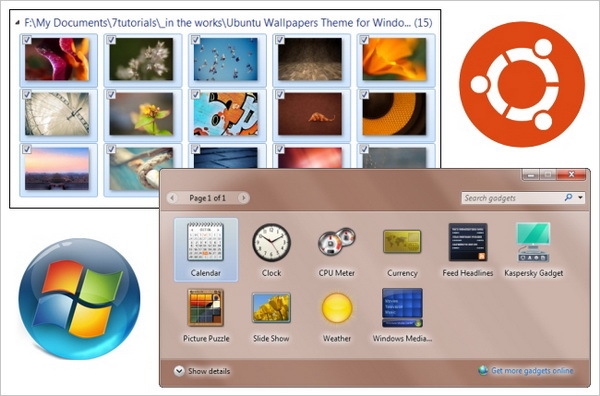 This Ubuntu themes also completed with audio which typically used for Linux Ubuntu. Almost no internal system changed, only color and background audio. Of course this wouldn’t disturb the performance of the computers windows. There are 15 high-resolution Ubuntu wallpapers included in the theme. Even if you are not a fan of Ubuntu Linux, you will appreciate their beauty and elegance.